Vintage Homer Laughlin Georgian Eggshell gravy boat and under plate. Plate is 9 in. long by 1 in high. Gravy Boat is 8.5 in long and 3.25 in high. No chips or cracks. Some wear on gold trim and ridge underneath gravy boat. Plate has some wear marks as shown in picture 9. I believe these are from the 50-60's. I took pictures in different lighting, with/without flash to try to capture color, most accurate is 2nd picture. Condition is very good with 2 noteable flaws - very small chip on spout, and hairline crack on the lid, see last 3 pictures. Homer Laughlin Granada Saucer plates in great condition 5-3/4"
VTg. Homer Laughlin 2 coffee cups, white with beige trim, Good used condition. They are 5 1/4" across berry Bowls. Both bowls are in mint condition. With Virginia Rose pattern. They are in very good condition! Price is for one (1) Plate. 28 Plates available. This pattern was available in four colors of Celadon Green, Mist Gray, Shell Pink and Cream Beige. Sold as is. This is an oval 11 1/2 inch platter with a gold trim. It has a picture titled “home in the wilderness” on the front of the platter. It also has green around it. This has been around for generations so there is some wear to it, but in good condition. Please look at pictures closely. Homer Laughlin Virginia Rose Plate. Hand painted Design With Decorative Edges. 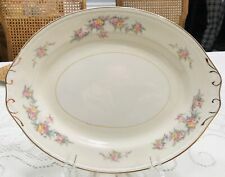 This Homer Laughlin Virginia Rose plate has decorative edges. It also features a hand painted room scene on front( look at pictures). It measures 9 1/2 inches. Large Chop Serving Plate 12". Made in USA. They are 8 1/8" wide and in excellent condition! Price is for one (1) Plate. 5 Plates available. 7.4" long, 4.3" wide, 4" high. With Virginia Rose pattern. Well marked with MADE USA. All large pieces are marked, but the smaller one aren't. They have nice gold trim around the edges. 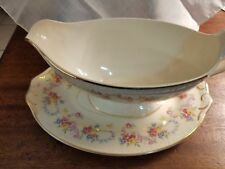 Antique and authentic 18k plated gravy boat. Item is in good condition. BOTTOM IS MARKED "HLC USA". BEIGE WITH BROWN SPECKLES. Would be a nice piece to put on the wall or display in a Case. The weight of the plate itself is 14 oz. All enclosed pictures are of actual item for sale. I have 16 available and the price is for one. These are all in excellent condition. No utensil marks or scratches. These plates are 10 1/8" in dia. This item consists of a small, antique. Used set of dessert plates with silver tone trim, 1 has a faint gray blemish, 2 other have light scratching as pictured. See pictures for details. This is a great set of Homer Laughlin cups and saucers. They appear on used. Most likely new were dishes as they are marked lead free on the bottom. I do not know the pattern name but they are ivory dishes with tan and peach patchwork design around the rim I accept PayPal. Buyer pays shipping. Payment is requested within three days of purchase. I will ship within two days of receiving payment. Please email with questions, thanks. Price is for one (1) bowl. 8 bowls available. Antique Homer Laughlin Virginia Rose Pink White Serving Dinner Platter 13"
Please read this description fully before purchasing. Good preowned condition. 1 tiny chip on edge-see pics! Please view all pictures before purchase. I try my best to accurately describe condition of item. Allow up to three business days for handling. Unpaid case automatically opens if item not paid for within 2 days of purchasing. Feel free to contact me with any issues after purchase. Check out my other items! I can combine shipping. Shipping is non-refundable. 16" long and 12 1/2" wide. Very Good Condition! It has a hairline crack (see picture) and will make a great addition to anyone's collection. and make sure of what you are purchasing. Bread and butter, sandwich, dessert and more are served on this restaurant ware. Vintage Homer Laughlin 9 inches wide. Good condition. A Slight crack has been sealed. The bowl is cream colored with an ivory glaze with burnt orange edging. The rose accent is pink in color. The watermark on the bottom suggests a manufacture date of January 1955.